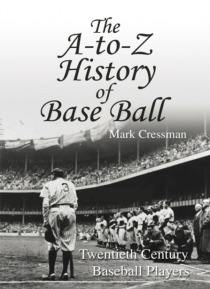 The A to Z History of Base Ball: Twentieth Century Baseball Players explores the careers of the finest professional baseball players who played during the 20th Century. You will discover the details of players' career, accomplishments and their career statistics as well as their rank amongst the all-time greats. You will learn about such baseball immortals as Hank Aaron, Ty Cobb, Lou Gehrig, Josh … Gibson, Christy Mathewson, Satchel Paige, Babe Ruth, Ted Williams, and many more. Turn the pages and immerse yourself in twentieth century baseball players facts.